Ironically what follows has come to be known as the Lord’s Prayer and is repeated verbatim by people all over the world in their own language. Notice Jesus begins by saying not WHAT you should pray word for word, but HOW you should pray. 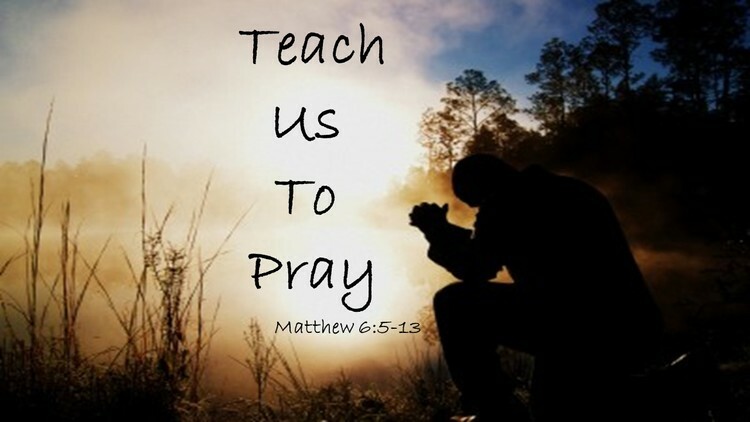 HOW “means ‘in this manner.’ It probably implies that what follows is more an example of how to pray instead of a formula to be mechanically repeated.” Even the early “church Fathers could speak of (The Lord’s prayer) as an outline” for prayer (Davies and Allison, Matthew 1-7, p. 599). Jesus isn’t saying never repeat this prayer again. It is an awe inspiring experience to hear hundreds of people speak the words of Jesus in unison. Early church descriptions said it sounded like loud thunder. When Jesus first taught us to pray using these words however, He was saying “in this manner” use your own words as you use this framework for your prayer to God. The more familiar version of the Lord’s Prayer is found in Matthew 6:9-13. It begins with an address to the One to whom we are speaking. Before you start thinking this is a lesson on individual prayer, take a look at the very first word: “our.” Even when we pray individually, we are taught to pray with “our” relationship with others in mind. God is not just “my” father but “our” father as well. The whole prayer in fact is plural: give us, forgive us, lead us, deliver us. The implications of this are that we need each other and should not only have a personal relationship with Jesus without also having a personal relationship with His people. It is not Jesus and me. It should be Jesus and we. When a word is repeated over and over and over and over and over again, it loses its meaning and emphasis. The F bomb or the N word are shocking and often evoke a strong emotion, but when someone uses those words in every sentence, they lose their effectiveness. Many people say the names of God in anger frequently. Clearly they are not praying and His name has no meaning to them. Hallowed in this context means to revere or honor or keep separate from all other names. Overusing God’s name in prayer or in daily conversation can also make His name common and powerless to us. Saying OMG frequently or using the name of Jesus as a filler or punctuation mark can make the name of God just like any other name rather than the name above all other names. Listen closely when you pray. If you say God or Jesus or Lord or Father after every sentence, you are saying it too much. Imagine if I wrote a letter to my favorite musical artist Bono like I used to pray. Thank you for inspiring me, O Great U2 Front Man. Your lyrics are transcendent, Your Rock and Roll Majesty. Wearer of Indoor Sunglasses, you are still cool, Sir Bono. I will forever sing your praises, Paul David Hewson – though not nearly as well as you, Bono. You truly live up to your nickname: the Irish Cowboy. It is this type of Christianese that confuses people and prevents others from praying, not knowing how because of so few good examples. Prayer should be a conversation just like you would have with your best friend not a royal address fit for a king in the 17th century. Say His name full of meaning and hallowed and not so often it becomes bereft of meaning and rings hollow. It is not to hasten the coming of Jesus for which we are to pray for the kingdom to come. There are stories of people coordinating their prayer time so they would not pray at the same time or else compel God to bring His coming sooner. God is not obligated to do as we ask. It is not for His benefit that we pray; it is for our benefit. God doesn’t need a reminder of what we need or that He is coming again. We pray, amongst other reasons, to remind ourselves of the big picture – that in the midst of all the finer details of our lives we can be sure that in the end all will be well when we see Jesus and all is already well because He is near. Jesus not only said He would come again to establish His kingdom here on earth, He also said the kingdom is near. When He described the kingdom, it was always the kingdom “is like” not “will be like” because we bring the kingdom now – not by our words even in prayer but by our actions. “In the Biblical tradition God’s will is usually accomplished through his people.” (p. 605-606) When we love even our enemies, help those in need, and visit the sick, we are bringing the kingdom come. And that is just the thing. Notice everything so far in this prayer has been about God: your name, your kingdom, your will. We have not asked for anything as of yet because this prayer has kept us focused on God rather than ourselves. So before we begin asking for what we need, we say YOUR will be done and it will be just as it is done in Heaven. The angels do His will in heaven without questioning, without complaint, without delay. May we do His will likewise.